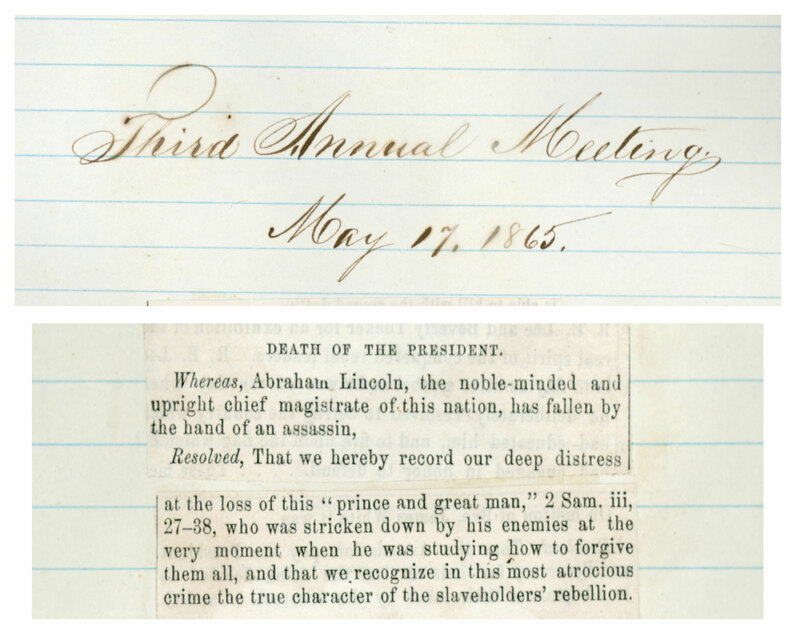 This is an excerpt from the Session Minutes of the 1865 General Conference of Seventh-day Adventist, lamenting Lincoln’s death. The Session took place on May 17, 1865 and the minutes were published in the Advent Review and Sabbath Herald in the May 23, 1865 issue. The church’s Secretary was also an earlier editor of the Advent Review and Sabbath Herald and thus pasted the minutes into the Records after they had been published. Resolved, That we hereby record our deep distress at the loss of this "prince and great man," 2 Sam. iii, 27-28, who was stricken down by his enemies at the very moment when he was studying how to forgive them all, and that we recognize in this most atrocious crime the true character of the slaveholders' rebellion.